These past two days have just about left me speechless. Okay, the last eight months, three weeks and two days have just left me about speechless. To all my friends, family, and strangers that donated to Ruby in the Rift- this blog post is for you. Heck, this whole blog is for you. Thank you for your support, financial and emotional. Because of people like YOU these girls received the gift of a lifetime today. Because of people like YOU the icy silence around menstruation is being broken. Let awareness of the importance of menstrual health and equity spread like wildfire, 'cause these Rift Kits are HOT! Here is a special shout-out to our three main partners that made these past two days such a special success. First and foremost, a huge thank you to Ruby Cup. This company creates sustainable, environmentally friendly period alternative products called Ruby Cups. Made out of 100% food grade, non-toxic silicone, these little cups are changing how girls and women around the world feel about their periods. For every cup that is purchased, one cup is donated to a girl in need. This means that girls in rural areas and developing countries no longer have to stress about what they're going to use at that time of the month, moreover what they can afford to use at the time of the month. Say good-bye to improper materials, like mattress stuffing, newspaper and olds rags, and say hello to 12 hours (and ten years!) of leak-free protection. I love that this project is providing girls with another tool in their menses kit so they can feel confident and go to school worry-free. The fact that these Ruby Cups are reusable, durable, and cut down on the waste that is polluting our environment make them even cooler. Golda, from Golden Girl Foundation, reveals the menstrual cup to a group of girls at Shoe4Africa Martin Lel Secondary School. I'm not sure how she finds the time to do all that she does, but Golda of the Golden Girls Foundation is an inspiration to girls in Africa, and an inspiration to me. On top of being a mother while also pursuing her Phd at the University of Nairobi, Golda is busy running her foundation which is aimed at improving the socio-economic lives of girls and women in Africa. Through various initiatives that train and educate women in need to provide for themselves, Golda changes the lives of everyone she meets. Thank you Golden Girls for partnering with Cross World Africa, and aiding in our Ruby Cup distribution. In the early planning stages of Ruby in the Rift, I contacted Chicobag, a company based in California that makes these TOTALLY AWESOME reusable bags that pack down into a small, portable pouch. I received my first Chicobag as a gift in college, and proceded to use it for anything and everything. From jaunts to the grocery store to teaching in South East Asia... from chasing my dog at the beach to backpacking through Central America, my Chicobag came with me for all occasions. Naturally, I had to reach out to this company that is committed to helping "humanity bag the single use habit". Just as menstrual cups replace other disposable sanitary products, these reusable bags replace the plastic polluting our environment. To me, it seemed like a match made in heaven, a sustainable solution that can bring about real change. Luckily for these girls, Chicobag agreed and donated 200 bags to Ruby in the Rift. Hats off and Chicobags out to Kenya for their environmental conscious and progressive policymaking! As excited as the girls were to receive their kits, they were STOKED to be gifted their Chicobags. Did I mention the Kenyan government banned the use of plastic bags in August 2017? In an effort to reduce plastic pollution, the government has been trying stop plastic bag production and distribution for the past 15 years, with the policy finally coming to fruition last summer. The country is now in need of a sustainable bag, and Chicobags is a perfect alternative to wasteful products. 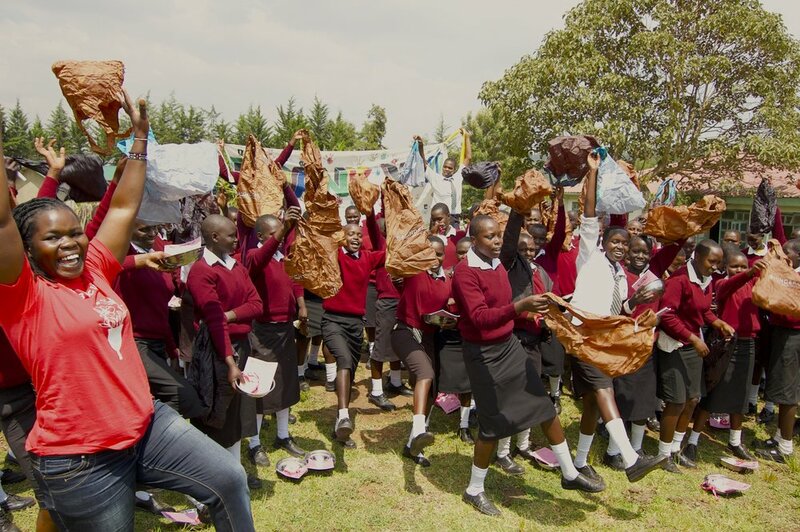 Not only is Ruby in the Rift helping girls stay in school, but it is keeping disposable sanitation and plastic bag waste out of the environment. If that is not cause for celebration, I do not know what is!